Finally, after a very busy and successful month in Brazil, the campaign for Edificio Ecologico (EE), led by Ed Richards from Leo Burnett and the people at INATA, is launching. EE is a pioneer venture that gets middle-class families in high-rise buildings to recycle the materials that they would otherwise throw away with the conventional rubbish. 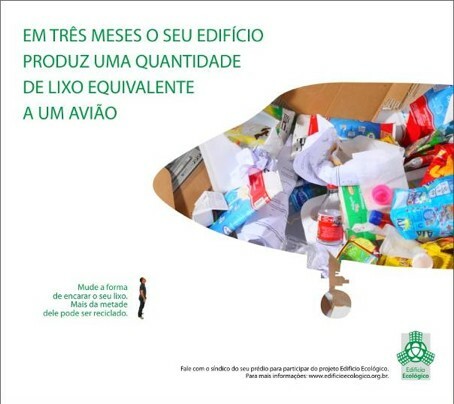 The primary objectives of EE are to improve the city’s environment and the lives of the hundreds of street garbage pickers who rummage through the garbage throughout the city of Recife. The major hurdle until now has been that very few people know about the initiative. This is where TIE and Ed came in. Ed’s objective was to increase the number of apartment buildings partnering with EE – specifically 100 buildings within a year – by prompting people to sign up to the scheme via an effective communications campaign. Well – the campaign kicked off today. It started at 6am with a live interview on Globo TV which ran for a large part of the day, and will then be followed by a 3-day trade-fair at the Recife Convention Centre. Next the folder campaign will kick off which will be a way of contacting 100 buildings directly with various communication pieces – posters, doorhandle pieces etc. There have also been a couple of articles in the local newspaper, as well as a full page ad, and just from that communication EE have secured at least 3 new buildings as new partners. And, on top of all of this, INATA is still pushing ahead with trying to secure free billboard and bus back media and we’re crossing our fingers that will all come to fruition. It’s a thorough campaign and everyone involved are really excited and energized, anxiously awaiting the responses. This is a perfect example of what collaboration is all about, and just how powerful it can be.